1) Generously sprinkle the lamb with salt and pepper and put the lamb in re-sealable plastic bag or dish, and bring up to room temp. 2) Preheat the oven to 450 degrees. 3) Heat the remaining olive oil, 2 Tbs, on high in a heavy pan. Sear the rack, meat side down until brown and crispy, about 2 minutes. Then Place the rack on a baking sheet. Repeat with all 3 racks of lamb. 4) Put the racks of lamb in the oven, and cook for about 15 minutes for medium rare. 5) Let the meat rest for about 5 minutes. Slice through the meat on either side of the bone to make individual chops. 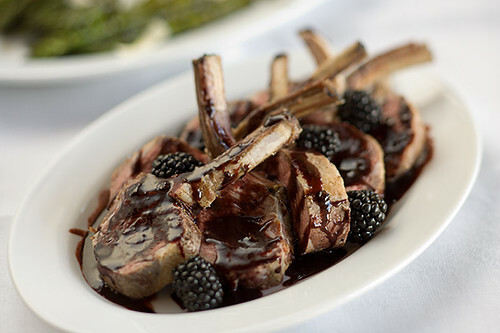 6) Drizzle with the Zinfandel sauce, and sprinkle with blackberries. While there may seem like there are a lot of ingredients in this recipe, it is actually a really simple recipe for a rich red wine sauce. While the prep is easy, it does take quite a while to simmer the sauce, so start this before anything else. Often I will make the sauce a day or two ahead of time, because it can easily be reheated when you need it. Feel free to make this sauce with other types of wine. For this meal I chose Zinfandel to pull the flavor of the blackberries out. 1) In a pot, heat the oil over medium-high heat. 2) Add the mushrooms, carrot, celery and onion and cook until the vegetables are deep golden brown and caramelizing. 3) Add the butter and melt all the way. Sprinkle the flour over the vegetables, and let them cook for about 5 minutes. Stir constantly, making sure that the flour cooks, but doesn’t stick. 4) Add the tomato paste, garlic, parsley and bay leaves along with stock and wine. 5) Simmer on low heat for about an hour, stirring occasionally until the mixture has reduced by half. Strain through a fine sieve, and adjust seasonings with salt and pepper. Here’s another recipe you might like.